I finally finished a square for my Quilts for Breast Cancer group that I've been working on for a few weeks. 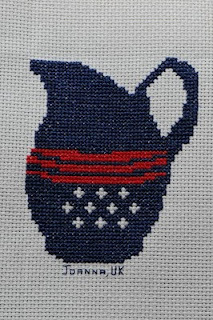 The design was for a pitcher jug but for some reason I've lost the original design I had so found myself having to design one from scratch. 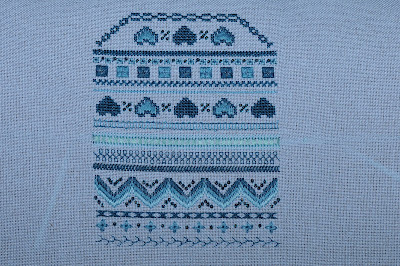 That was the easy part, it was the actual stitching that was the hardest, I've found I'm no good at massive blocks of the same colour...I get too bored and find myself picking something else up! Quilts for Breast Cancer is a Yahoo group that is made up of voluntary stitchers and quilters who make lap quilts for those who are either fighting or recovering from breast cancer. They are a wonderful group of ladies who always welcome new members, all you have to do is click on the link in this post to go to their page. You can either stitch a square for a specific quilt or send in 'spare' squares that you can stitch anytime you'd like for emergency quilts. Breast cancer is a horrific disease that we know well in our family, these lap quilts are mostly a big surprise for the recipiant and just lets the ladies (or gentlemen...as yes they can suffer from BC) know that they're not alone and we're all thinking of them. I've been working on my Beau Bands SAL and have managed to complete section 1. Beau Bands is a private SAL with my Yahoo group Friendly Stitchers and is designed by the very talented Abi. Here are some close up photographs of my band taken by DH. 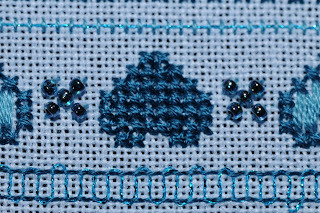 Bands 1 - 8 and you can just see the top of band 9 which was the drawn thread band. Bands 8-15 you can see the ribbon threaded through band 9. I was a bit fussy about this band and re-threaded twice on one end until it looked neat enough for me, I've left quite a big bit on each end but these will get sewn in on making up. 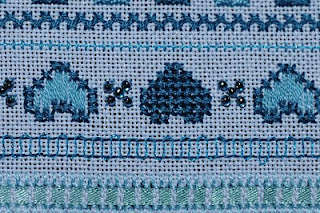 Bands 11 and 15 were new ones for me; Vandyke stitch and Fly stitch both of which I've never tried before but really enjoyed doing them. 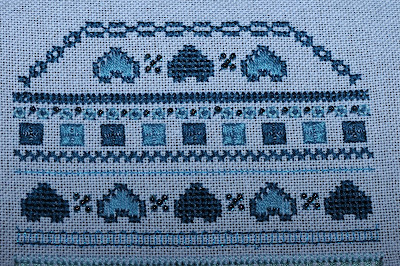 Close up photos of my drawn thread band, Snake stitch which was 'snaked' with metallic and cross stitch hearts. Finally a photo of the whole of section 1. Now I'm back to my Darcy photostitch as Beau Bands is up to date, still got a calendar square to finish but I'll try and do that this week when all 3 kids are in nursery/school. The SAL looks good, the close up photos came out really well. The Beau Bands looks lovely, i really like the colours you have chosen for this one. Your Beau Bands looks great. 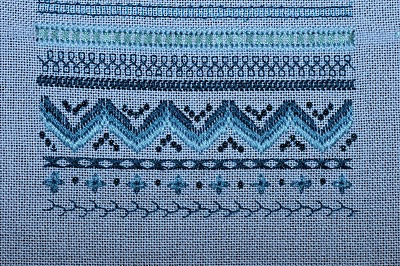 I am loving the Beau Bands - blue is my favourite colour and I'm fond of specialty stitches so this is of course going to ring high on the Grace-O-Meter! Looking brilliant. I see you're doing well with the reading too! And so does your quilt square - wonderful idea! I love the colors in Beau Bands. That is a very pretty design. Nice job on both projects, the band sampler is very pretty. Very cute quilt square and the SAL is very pretty. That's a nice way to try out some new stitches. Great job! Both the Beau Bands and Quilt Square look great. I love learning and doing speciality stitches. Lovely quilt block finish! The sampler is beautiful.